Pothashang News Service: Imphal, May 23, 2018: Chief minister Nongthombam Biren Sigh today received 780 complaints and personally met 2, 500 people on Meeyamgi Numit. Talking to reporters the chief minister appreciated the tireless efforts of the government officials to make the new initiatives of the government successful. He said that it is indeed glad to see that the employees of the government are working with sincerity and seriously for the welfare of the people. The government officials are very supportive and eager to work at the grassroots to address the grievances of the people under the new initiatives of the government such as ‘Go to Village’ mission, he added. We all should realise that all the employees of the machinery of the government including chief minister is for the people and to serve the people with human touch, he added. 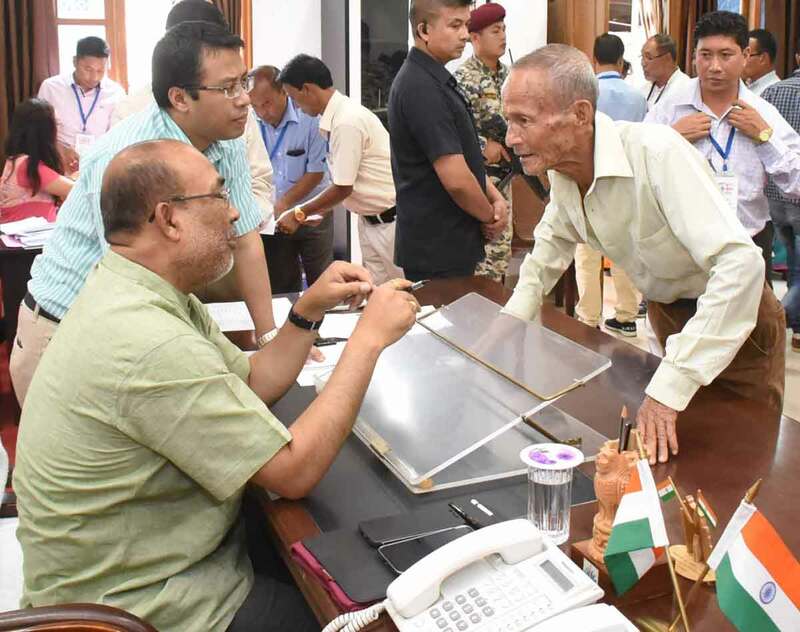 Responding to the rumour that the departments concerned are not taking necessary actions of the directions of the chief minister, Biren Singh said the government had introduced a monitoring system at his office where the Grievance Cell keep track of the follow up action taken up by the departments concerned. The Grievance Cell is informing the aggrieved person about the status of people’s complaint from time to time by sending SMS through their mobile numbers. The chief minister appealed to the officials of the all departments to treat his directions to address the grievances met during Meeyamgi Numit as their official work. And those officials who fail to take up necessary action of the said directions would be punished, he cautioned. Due to ‘Go to Village’ mission on “Meeyamgi Numit” which is held on 15 of every month was rescheduled for this month on Wednesday. Highlighting the issue of the illegal immigrants in the state, Biren Singh said, “If our own people are helping the illegal immigrants to get settled in the state then the future of the indigenous people and the State would be at stake.” The landlords need to identify those tenants before renting the room, he added. He said the government had removed Common Service Centres as access point to provide Aadhar related services throughout the State. Such Aadhar related services would be done by government recognised agency only. He informed the media persons that he had instructed DGP to install special Check post with gate at border gates such as Behiang, Moreh, Mao, Jiri etc so that we could check and curb the influx of illegal immigrants in the State. He cautioned that if an illegal immigrant gets caught at Pallel Police station, then all the concerned Police Officers of Tengnoupal, Moreh Police stations etc. which permitted the person to enter illegally in the state would face stringent action. He further clarified that those immigrants who posses valid identification documents are free to travel in the State.